Somewhere in our bedrooms was a small pile of dead AA batteries from the sleepless nights with our faces glowing in the screen of capturing all of the existing 150 little evolving creatures we pit in a fight to the faint. Nowadays the batteries are built into all electronic devices and the 150 has been upped to a zillion billion. 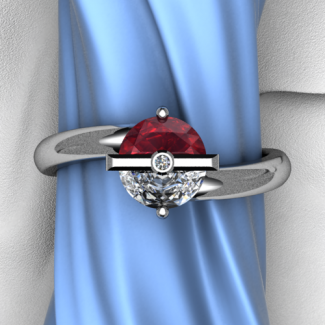 Nothing says "I Choose You" like our Trainer's Band. 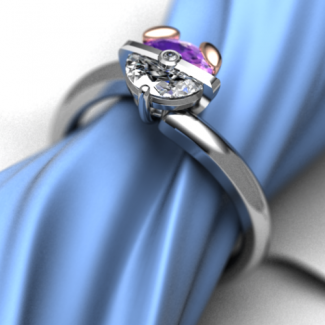 The engagement ring has a plain twisted shank. All variations of this ring has a Created Ruby and Cubic Zirconium cut in half to create the symmetrical design in the center. 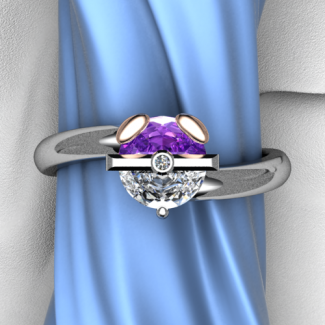 The Master Starter Band has 14K Rose Gold to hold a Created Half Moon Amethyst.